La Fornarina (i.e. "The baker's daughter") is a 1944 Italian historical drama film directed by Enrico Guazzoni and starring Lída Baarová. It is loosely based on real life events of Raphael's model Margarita Luti. ^ Roberto Chiti; Roberto Poppi; Enrico Lancia. Dizionario del cinema italiano: I film. Gremese, 1991. ISBN 8876055487. ^ Indro Montanelli (20 January 1946). "La Fornarina (review)". Corriere d'informazione (19). This article related to an Italian film of the 1940s is a stub. You can help Wikipedia by expanding it. 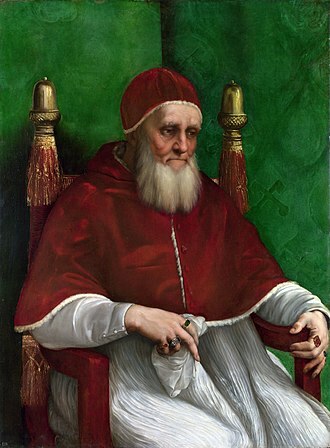 Pope Julius II, nicknamed The Fearsome Pope and The Warrior Pope, born Giuliano della Rovere, was Pope from 1 November 1503 to his death in 1513. In addition to a military policy, he personally led troops into battle on at least two occasions. There is disagreement about Juliuss year of birth, for some sources put it as late as 1453, Giuliano della Rovere was the son of Rafaello della Rovere. Francesco della Rovere was his uncle and he was educated among the Franciscans by his uncle, who took him under his special charge and sent him to a Franciscan friary in Perugia with the purpose of obtaining knowledge of the sciences. After his uncle was elected Pope Sixtus IV, della Rovere was promoted to be cardinal, taking the title as that formerly held by his uncle. With his uncle he obtained great influence, and in addition to the archbishopric of Avignon he held no fewer than eight bishoprics, including Lausanne from 1472. In June 1474, della Rovere led an army to Todi and Spoleto, around this time, in 1483, an illegitimate daughter was born, Felice della Rovere. 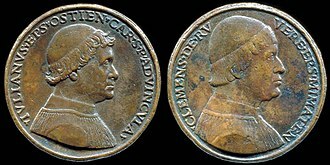 Della Rovere and angry, accused Borgia of being elected over him, in 1494 he joined Charles VIII of France who was undertaking a military expedition into Italy. This was, in Andrew Greeleys view, almost certainly by means of bribery with money, but also, per Ott and Hughes, with promises. Giuliano Della Rovere thenceforth took the name of his fourth century predecessor, Julius I, indeed, on the day of his election, he declared I will not live in the same rooms as the Borgias lived. He desecrated the Holy Church as none before and he usurped the papal power by the devils aid, and I forbid under the pain of excommunication anyone to speak or think of Borgia again. His name and memory must be forgotten and it must be crossed out of every document and memorial. All paintings made of the Borgias or for them must be covered over with black crepe, all the tombs of the Borgias must be opened and their bodies sent back to where they belong—to Spain. The Borgias apartments remained sealed until the 19th Century, the combination was, however, at first little more than nominal, and was not immediately effective in compelling the Venetians to deliver up more than a few unimportant places in the Romagna. The Marriage of the Virgin, known as Lo Sposalizio, is an oil painting by the Italian High Renaissance artist Raphael. Completed in 1504 for the Franciscan church of San Francesco, Città di Castello and it changed hands several times before settling in 1806 at the Pinacoteca di Brera. In the early years of the 15th century, patrons in Citta di Castello sent three commissions to Raphaels teacher Pietro Perugino which, in Peruginos absence, were completed by Raphael, the Marriage of the Virgin was the last of these. Evidently inspired by one of Peruginos paintings, known as Marriage of the Virgin, Raphael completed his own work, according to the date placed next to his signature and this particular piece was commissioned by one Filippo degli Albezzini to hang in a church dedicated to Saint Francis. It remained in its home until General Giuseppe Lechi led forces to Città di Castello to liberate it from Austrian occupation. Restoring Raphael in the Cambridge Companion to Raphael reports that the painting remained with Lechi to his death in 1804, but Lechi died in 1836. The Cyclopedia of Painters and Paintings states rather that Lechi sold the piece in 1801 to one Giacomo Sannazaro, who himself sold the piece in 1804 to the Ospedale Maggiore in Milan. By whatever means it arrived there, it was in the possession of the hospital for a short time and it has since been displayed in the Pinacoteca di Brera, in spite of an 1859 proposal to donate the image to France after that countrys army had entered Milan. Through these various relocations, the painting was damaged, the panel had several cracks in the upper half, while there was rippling and bowing throughout. This decision on the part of Molteni has permitted 20th-century art historians to use infrared reflectography to study the underdrawing beneath the art work. Molteni undertook to clean the surface of the painting, which had subjected to restoration before. He did not clean aggressively, as he wanted to be sure that elements of the painting were preserved. The Cyclopedia of Painters and Paintings indicates that the painting is somewhat discoloured, in this work, he continued, there is a temple drawn in perspective with such evident care that it is marvellous to behold the difficulty of the problems which he has there set himself to solve. Never a very disciplined or productive painter, his artistic productivity fell still further after this, which committed him to attend on the pope most days, and travel with him. He had to take orders as a friar, despite having a wife. He now painted mostly portraits, and relatively few works of his survive compared to his contemporaries in Rome. This limited his involvement with the Mannerist style of his years, having achieved success as a lutanist in Venice when young, he turned to painting and trained with Giovanni Bellini and Giorgione. He painted portraits and religious subjects in oils, and once he was established avoided the large fresco schemes that took up so much of the time of Raphael and Michelangelo. 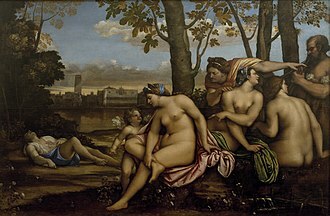 His subsequent influence was limited by his lack of prominent pupils, compared to Raphael at least, Sebastiano del Piombo was probably born in Venice, though there is no certainty as to his background. His birthdate is extrapolated from Vasaris statement that he was 62 at his death in 1547 and that he was first known as a lutanist may suggest an upper-middle class background, the extent to which his lute-playing was professional is unclear. Like his contemporary Raphael, his career was marked by his ability to get on well with other artists and patrons. No signed or firmly documented works survive from his painting in Venice. As with other artists, some of Sebastianos works have long confused with Giorgiones. Like Titian, he may have completed some works left unfinished at Giorgiones death in 1510, the earliest significant work attributed to him is a portrait of a girl in Budapest, of about 1505. He is now assigned the unfinished and reworked Judgement of Solomon now at Kingston Lacy. Still over 2 x 3 metres, it originally to have been even larger. There are two versions of the elaborate architectural background, which was a recurrent interest of Sebastianos Venetian period, the last setting is in a basilica, which may reflect a more learned picture intended for a building holding courts of justice. Four standing figures of saints in niches on the organ-shutters of San Bartolomeo, now in the Gallerie dellAccademia in Venice, 1508-09, and are very Giorgionesque, especially the pair on the insides. 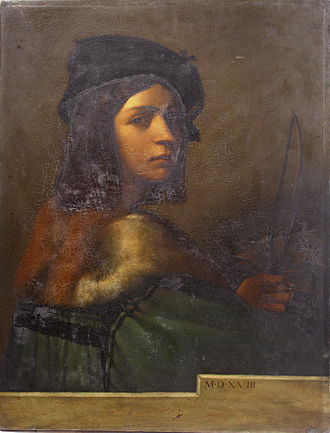 Margarita Luti was the mistress and model of Raphael. 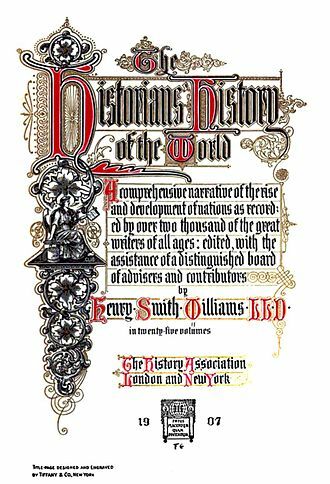 The story of their love has become the archetypal artist-model relationship of Western tradition, of her, Flaubert wrote, in his Dictionary of Received Ideas, Fornarina. That is all you need to know, according to Vasari, Raphael was a very amorous man and affectionate towards the ladies. He is said to have painted portraits of his mistress and to have assigned the engraver il Baviera to serve as her page. When commissioned by Agostino Chigi to decorate the Villa Farnesina, he was unable to dedicate himself properly to his due to his infatuation - until she was allowed to come to live at his side. Again according to Vasari, it was Raphaels immoderate indulgence in amorous pleasures, one day taken to excess, by the mid-eighteenth century she was referred to as La Fornarina. Although this story is retold in Passavants 1839 Life of Raphael and elsewhere, Missirini was known for his pseudo-traditions, se non è vero, è ben trovato. In 1897 a document was discovered indicating that Margherita, widowed daughter of Francesco Luti of Siena, a small residence in Via di Santa Dorotea is now identified as her former home, one of three possible sites examined by Lanciani. Two portraits by Raphael are identified as those of Margarita, La Fornarina, where she is naked from the waist up, the former was already the subject of several early testimonies before featuring in a 1642 inventory of the Barberini collection. X-ray analysis during restoration work at the beginning of the twenty-first century, sponsored by Estée Lauder and she wears a ribbon with the artists name, the ring may hint at betrothal and the depth of their bond. The latter work is identified by Vasari as a portrait of Raphaels mistress, whom he loved until he died, and of whom he made a most beautiful portrait, Vasari is said by Anthony Blunt to have invented the legend of Raphael. The Raphael-Fornarina myth has been reimagined ever since to fit the expectations of contemporary generations, in Comollis 1790 Life of Raphael, she is blamed for his death. 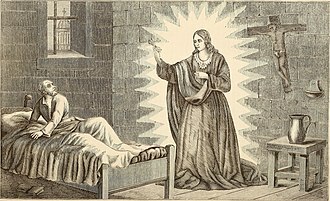 In Balzacs Splendeurs et misères des courtisanes, she is the femme fatale or belle juive, in Joseph Mérys 1854 novel Raphaël et la Fornarine, Raphael instead complains to the pope of the lack of blonde female models in Rome. 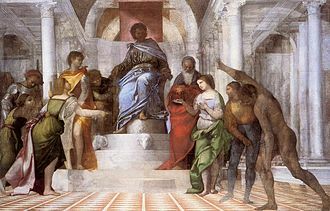 The Judgment of Solomon, 1508–10, now usually attributed to Sebastiano. Organ-shutters of San Bartolomeo, Venice, now displayed with outside pair at centre. In the Palazzo Te, Mantua.